Ships tomorrow if ordered in the next 1 hour and 33 minutes! 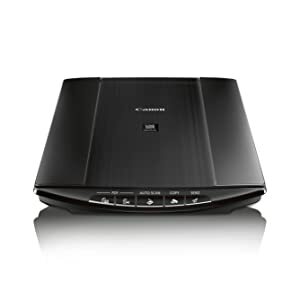 The CanoScan LiDE220 Color Image Scanner offers advanced features, easy operation and “Send to Cloud” functionality.1 The LiDE220 lets you upload images to the Cloud with remarkable ease. Providing a maximum optical resolution of 4800 x 4800 dpi2, its vivid 48-bit color depth is capable of producing over 281 trillion possible colors. An Auto Document Fix feature automatically produces beautiful scans with advanced image analysis and area-by-area data correction, while Auto Scan Mode3 automatically evaluates the item being scanned and saves it with the appropriate settings. The LiDE220 scanner also helps you work efficiently with five EZ Buttons that enable you to scan, copy, Send to Cloud1, or create a single or multipage PDF in a snap. 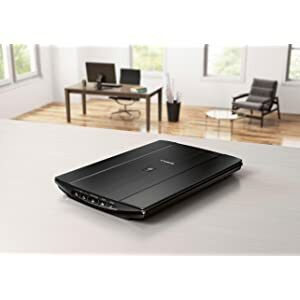 It scans fast too, creating a letter-sized color scan in approximately 10 seconds.4 Plus, it comes with a stand to enable vertical scanning — accommodating workspaces of just about any size. And the Advanced Z-LidTM Expansion Top extends up approximately one-inch and over the platen to let you scan large items, such as textbooks or other thick documents. The LiDE220 scanner uses one USB cable for both data and power, so plugging in is easy. The LiDE 220 includes My Image Garden5, a convenient software package that makes organizing your photos fun and easy. 4800 x 4800 dpi maximum optical color resolution, 48-bit color depth with over 281 trillion possible colors and 19,200 x 19,200 (Interpolated) software enhanced scans. Delivers a letter size color scan in approx. 10 seconds. Five buttons that enable you to scan, copy, Send to Cloud1 or create PDFs faster. 5. To install using Windows OS, .NET Framework 4 is required. Compatible still image formats are PDF (created using Canon PDF Creator only), JPEG (Exif), TIFF, and PNG. Compatible video formats are MOV (from select Canon digital cameras only) and MP4 (from select Canon digital camcorders only). Review "Canon CanoScan LiDE220 Color Image Scanner"